NORTH OLMSTED, OH., October 03, 2018, CommutAir, a United Express carrier (UAL), expands its route map into Canada. Starting October 4, 2018, CommutAir will operate five daily roundtrips from New York/Newark (EWR) and Washington D.C. (IAD) to Montreal’s Pierre-Elliot Trudeau International Airport (YUL). Montreal is CommutAir’s first international destination since transitioning to an all-jet fleet. 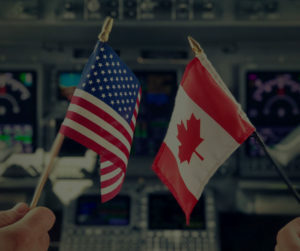 “We’re thrilled to add international service into Canada and look forward to watching our route map continue its rapid expansion as monthly aircraft deliveries fuel our growth,” said Joel Raymond, Chief Operating Officer. Founded in 1989, CommutAir operates as United Express and is majority-owned by Champlain Enterprises, Inc. and 40% owned by United Airlines, Inc. CommutAir operates ~1,000 weekly flights to 35+ destinations, using the Embraer ERJ145 aircraft, from bases in Newark, NJ, and Washington-Dulles. CommutAir’s 900+ employees are well-known in the industry for fostering a family culture and a friendly work environment.